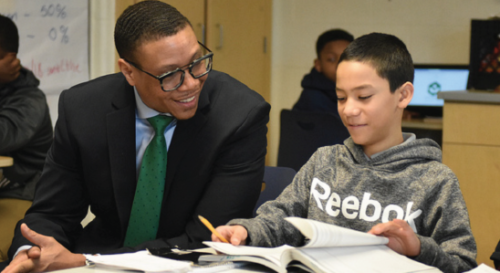 You can meet and chat* with acting Chancellor Lewis D. Ferebee at one of the Ferebe Friday events organized by the District of Columbia Public Schools. Ferebee Fridays start off in Ward 5 this coming Friday, February 1, but will happen at all eight wards. Ward 6’s event will take place at the Pretzel Bakery, 257 15th Street SE, on Friday, March 22. Below, Mr. Ferebee’s letter, along with the rest of the Ferebee Friday dates. In my first week as Acting Chancellor, I joined Mayor Bowser to celebrate Dr. Martin Luther King, Jr.’s legacy of service, discussed with community members how we can best support our students, and saw students at both Anne Beers Elementary School and Johnson Middle School engaged in rigorous and joyful learning experiences. I am committed to partnering with parents, families, community members, and educators to set every student up for success. In this work, I want to meet you wherever you spend your day – in the morning when you drop off your student at school, in the afternoon at a local restaurant or community space, or in the evening at a PTA meeting. In the coming weeks, I will be hosting “Ferebee Friday” events in all 8 wards at local businesses and community spots, and hope that you will take this opportunity to come share with me the story of your school and your community! We’re starting in Ward 5 this Friday, February 1 from 8:00 a.m. – 9:30 a.m. at the Village Cafe, which was proudly founded by DCPS graduates, and is located at 1272 5th Street, NE. Start your day by joining me to discuss what makes your neighborhood great and how we can ensure that there is a high-quality school at every grade level in every community. To find out where I will be stopping by next, visit dcps.dc.gov/findferebee and follow me on Twitter @DCPSChancellor. Your perspective is critical in shaping the future of our district and the opportunities we will provide our students. Through our continued partnership with students, families, and communities, we can ensure every student from Pre-K to 12th grade receives a high-quality education that prepares them to take advantage of the growth and opportunity in our thriving city. *Let’s face it: The amount of actual chatting you get to do at these kinds of open meet-and-greets is entirely dependent on how well you position yourself and how well you use your elbows when keeping other people away from Mr. Ferebee. Good luck with that.